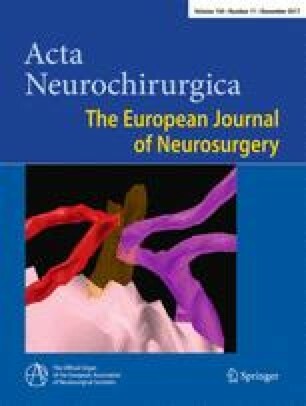 Assessing the clinical outcome of Vim radiosurgery with voxel-based morphometry: visual areas are linked with tremor arrest! Radiosurgery (RS) is an alternative to open standard stereotactic procedures (deep-brain stimulation or radiofrequency thalamotomy) for drug-resistant essential tremor (ET), aiming at the same target (ventro-intermediate nucleus, Vim). We investigated the Vim RS outcome using voxel-based morphometry by evaluating the interaction between clinical response and time. Thirty-eight patients with right-sided ET benefited from left unilateral Vim RS. Targeting was performed using 130 Gy and a single 4-mm collimator. Neurological and neuroimaging assessment was completed at baseline and 1 year. Clinical responders were considered those with at least 50% improvement in tremor score on the treated hand (TSTH). Interaction between clinical response and time showed the left temporal pole and occipital cortex (Brodmann area 19, including V4, V5 and the parahippocampal place area) as statistically significant. A decrease in gray matter density (GMD) 1 year after Vim RS correlated with higher TSTH improvement (Spearman = 0.01) for both anatomical areas. Higher baseline GMD within the left temporal pole correlated with better TSTH improvement (Spearman = 0.004). Statistically significant structural changes in the relationship to clinical response after Vim RS are present in remote areas, advocating a distant neurobiological effect. The former regions are mainly involved in locomotor monitoring toward the local and distant environment, suggesting the recruiting requirement in targeting of the specific visuomotor networks. Eric Guedj and Jean Régis equally contributed to the present study. This work has been supported by the Timone University Hospital, the Swiss National Science Foundation SNSF-205321-157,040, the Centre d’Imagerie BioMédicale (CIBM) of the University of Lausanne (UNIL), the University of Geneva (UniGe), the Centre Hospitalier Universitaire Vaudois (CHUV) and the Leenaards and Jeantet Foundations. This work was carried out thanks to the support of the A*MIDEX project (no. ANR-11-IDEX-0001-02) funded by the “Investissements d’Avenir” French Government program, managed by the French National Research Agency (ANR). All authors certify that they have no affiliations with or involvement in any organization or entity with any financial interest (such as honoraria; educational grants; participation in speakers’ bureaus; membership, employment, consultancies, stock ownership, or other equity interest; and expert testimony or patent-licensing arrangements), or non-financial interest (such as personal or professional relationships, affiliations, knowledge or beliefs) in the subject matter or materials discussed in this manuscript. The study was approved by the local ethics committee of Timone University Hospital, Marseille, France.